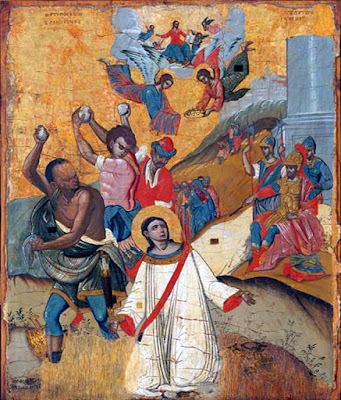 Saint Stephen was once commemorated the day after Christmas on December 26 as the first martyr (protomartyr) of the Christian community, and as such became famous throughout the Christian Church. On 26 December 415 his relics were found and transferred to Jerusalem, where in c.438/9 a shrine was built and dedicated to him. Stephen also became a popular subject with patristic and Roman/Byzantine homilists. Patriarch Proclus of Constantinople (+ 447), who seems to have preached the following encomium the day after Christmas (today the Orthodox Church celebrates Saint Stephen on December 27th), in his characterization of Stephen as witness to and martyr of Christ, portrays the characters who are involved in the stoning of Stephen according to Acts 6-7, from a fourfold perspective: he firstly presents his audience with a portrait of Stephen, secondly moves on to the dispute between Stephen and the Jews and his arrest, thirdly the preacher employs invective against the Jews regarding their true attitude towards Moses, and finally crowns his encomium on Stephen by portraying Christ as judge who hands over the prize of victory to Stephen. The sensible sun, which rises above the earth, has beside it as attendants, the stars of the Dipper, Orion, Pleiades and even the Morning Star. The Sun of Righteousness, however, who radiated by rising within the virginal womb, does not need assistance from the light of the stars, but has raised up the Protomartyr Stephen to shine beside His immortal rays. The sun, marches along its heavenly path between the north and the south, sometimes growing and sometimes shrinking with the gleam of the day. The Lord, coming from heaven for us, raised up righteousness and kept its gleam immaculate and undiminished. The sun succeeds the night, He combats death. It banishes the darkness, He subverts sin. It shines for twelve hours, He gleams forever. It marches with the stars, He shines with his Apostles. It wanders between years and seasons, He is preached by the Prophets and Evangelists. It weaves the hours with its journey, He empowers the word of the Church. It is painted on a chariot by painters, He is announced by the wise according to God as resting in a manger. This manger is like another Heaven surrounded by cherubic glory, comparable only to the Divine Throne, which contains rational feed. This manger received Him Who created all life. This manger holds Him Who holds all things. This manger which by grace became wider than all of Creation, in order to contain Him which all of Creation cannot contain. This manger which was announced by an angel-guided star. This manger which is a type of the sanctuary, and a cave which was fulfilled by the Church. Therefore, let us imitate the pious Magi, and receive in return the Church as Bethlehem. Let us embrace the sacred altar as the Cave, the sanctuary as the Manger, and instead of the Infant, let us embrace the bread blessed by the Infant. Having all these things in mind let us glorify Him whom the Protomartyr Stephen proclaimed as King. Wondrous things from a wondrous King! He was born yesterday, and today Stephen offers to Him a real and animate crown, a crown which he formed and fashioned alone. Stephen, who crowns the King, is crowned. Stephen, the blooming branch of faith, the fragrant rose of love, the flowery shoot of grace, the eternal vine fraught with grapes, the sweetened fruit of immortality. Stephen, the offshoot of the Crucified One reaching to Heaven, who full of every good work and word became an indestructible tower of the confession and an immovable fortress of patience. Stephen, the unconquered cross-bearing soldier of self-control and piety, the animated general, the undaunted orator, against the Christ-killers. But I keep on talking, and I have yet to speak of the events. Let us allow then the Divine Scriptures to crown Stephen. Scripture thus says, that Stephen was full of grace and power who "performed great wonders and signs among the people." But how can I praise Stephen, when divine grace itself has fashioned a crown for him, the crown which crowns every martyr? What discourse can I offer to the most brilliant martyr in the world, with what words can I ornament him who worked so many miracles? Scripture thus says, that Stephen was full of grace and power who "performed great wonders and signs among the people." Divine grace and divine power both fashioned at the same time the crown of Stephen, preparing him for the good fight. One upheld his faith, and the other prepared him for martyrdom. One for service as a deacon, and the other in his words. One in his courage, and the other trained him in patience. One was towards miracles, and the other prepared him for success. Grace and Power are stems from the same root, an eternal pair, a branch from the same tree of faith, sharing in each other eternally. Grace and Power, the most beautiful eyes of orthodoxy, the twin breasts of the Church, the fellow soldiers of Christ. The vigilant guards of Stephen. Scripture thus says, that Stephen was "full of grace and power." Stephen was the censer of grace, who gave off the fragrance of the incense of holiness. He was a spring of grace that gushed forth eternal streams of virtue. The Nile of Grace overflowing with piety. The Athlete of Grace unbeatable by any opponent. The Soldier of Grace, who fought against everything villainous and everything fearful, and stood unshaken in every attack, accepting with perseverance the persecutions, working wonders, banishing the passions, healing sicknesses, banishing demons, serving the poor, comforting those with diseases, embracing widows, protecting orphans and those unjustly accused, increasing preaching, proclaiming the faith, talking about and boasting in the Cross, the nails, the reed, glorifying the bindings, declaring the spear, which on our behalf pierced the side of the Lord, venerating the Passion of the Lord Who put death to death. Putting forward the Manger, and boasting in the Swaddling Clothes, praising the slaps, without being ashamed of the tribunal of Pilate, without hiding the Tomb of the Lord, proud in the Resurrection. Rebuking the Jews, thwarting the Pharisees, shaming the Sadducees, stopping the mouths of the Scribes. Interpreting the Law, examining the Prophets, analyzing the Scriptures and finding Christ there shining. Standing before and censuring the lawless crucifiers. An opponent of the impious, vanquishing with his faith the unbelieving Jews who opposed his preaching. "Opposition arose, however, from members of the Synagogue of the Freedmen (as it was called) — Jews of Cyrene and Alexandria as well as the provinces of Cilicia and Asia — who began to argue with Stephen. But they could not stand up against the wisdom the Spirit gave him as he spoke." Great are the waves but the captain is heavenly, bitter is the hurricane but the ship carries a cross, repetitious is the squall but the keel is firm. The waves cannot rise up against Heaven, the wicked spirit cannot fight the heavenly one. It cannot destroy the hull that is controlled by Life. Why the discussion? It concerns Him who was mysteriously carried in the womb, Him who was born supernaturally, Him who was suckled beyond all reason. How without a union did the Virgin become a mother, how after childbirth did she remain a virgin, how did nature give its seat to the miracle, for incarnated within Mary He did not cast off His own proportions, but the Uncontainable One wished to shrink as an infant? How did He although an embryo create all the embryos, how did He who was born give the ability to be born to all, how did He who suckled also give to all infants the source of their milk? This is the difference between Law and Grace. The Law condemns, Grace forgives, the Law sends you to hell, Grace saves you, the Law serves, Grace exercises authority, the Law kills sin, Grace makes sin disappear, the Law holds the sword, Grace uses mercy, the Law has the public seat, Grace has the authority of the king, the Law binds with a rope the condemned, Grace being philanthropic takes away the symbol of death. And although Stephen spoke these divine words of grace to the Jews, the God-fighters rose up and grabbed him and led him to the Sanhedrin. Where he was grabbed there was a Jewish tumult, where there was disturbance there was their Christ-hating crowd, where unjust murder was considered there was the gathering the scribes. Why do you profane the seat of Moses you lawless Jews? Why do you corrupt the throne decorated by the Law? The Law of Moses said: "Do not murder. Do not bear false witness." Therefore either keep the Law or distance yourself from this place. But they brought forward false witnesses who said: "This fellow never stops speaking against this holy place and against the law. For we have heard him say that this Jesus of Nazareth will destroy this place and change the customs Moses handed down to us." They also brought forward others to speak lies, saying: "We have heard Stephen speak blasphemous words against Moses and against God." Now you marvel at Moses, O slanderer; now you honor him as a lawgiver, whilst when he lived you spit on him? Now as a keeper of the Law you are enraged and disturbed, and embracing God, you want to be justified? Did you not throw stones at Moses? Did you not prefer idols of stone and wood over God? And now you want to murder, using piety as a justification? To spill the blood of the innocent you pretend to reverence God? Just as then, so now you twist the truth. Then you boldly blasphemed and now with irreverence you honor. You who are always in blood, you who always form bands of false witnesses. "Then they secretly persuaded some men to say, 'We have heard Stephen speak blasphemous words against Moses and against God.'" What words did he speak? "For we have heard him say that this Jesus of Nazareth will destroy this place." So what? If you kill Stephen, will not the place be destroyed? Rather, will it not be destroyed because because you killed the Lord and His servant? Because with the Shepherd you sacrificed the sheep, with the King you slaughtered the soldier? A city cannot stand if its King has been killed. Nor can the Temple be honored if the Master was murdered. Perhaps Stephen said the "your house will become desolate"? Perhaps Stephen said the "there will not remain one stone upon another of this Temple"? A strange thing and beyond words! For God to speak and man to be condemned! For God to make the decision and man to be accused! For the King to bring about and the soldier to direct it! You are the cause of this destruction O Jew! You set up the cross and disturbed Jerusalem, saying: "May His blood be upon us and upon our children." Receive now the condemnation determined for you. And Scripture says: "Stephen, full of the Holy Spirit, looked up to heaven and saw the glory of God, and Jesus standing at the right hand of God. 'Look,' he said, 'I see heaven open and the Son of Man standing at the right hand of God.'" Then how did Paul say: "We have such a high priest, one who is seated at the right hand of the throne of the Majesty in the heavens"? What was the cause of His standing? What important event made Him stand up from His paternal throne? He saw the athlete fighting and He got up and awarded him with the victory. He saw him flying in the air and opened to him the heavenly harbor. "Therefore do not fear Stephen, for no one will be unjust towards your struggle. I got up from My throne because I want to place you at My right hand. Because I see your daring faith in Me who was crucified. I am the one who you saw hanging on the wood with flesh. For your faith I am awarding you. I am the judge of your martyrdom as well as the athlete. I fought on the cross as if it was a place to wrestle. They arrested Me and the opponent the devil I vanquished. Do not fear those who stone you, for they unwillingly are making for you a ladder leading to Heaven. Do not fear those who stone you, for the stones have become a ladder for you to ascend to the heavens. Do not fear the stones, for you carry within yourself the cornerstone Jesus Christ. To Whom be glory and power unto the ages of ages. Amen.